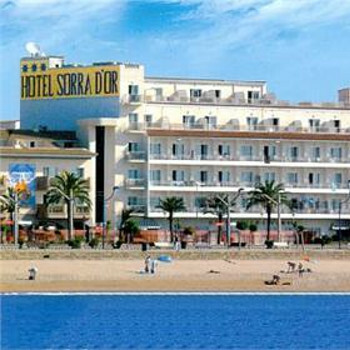 The Sorra d’Or is an established family-run hotel, tastefully decorated with marble floors and offering a friendly ambience. It’s within an easy stroll of the shops and bars, and beach lovers need only cross the street and coastal railway line. We travelled to Malgrat with my husband, a 4 year old, an 11 month old baby and my parents, both in their 60s- quite an age range! Hotel was good for basics, but if you're looking for an amazing pool and haute cuisine, this is not the hotel for you. Drinks were always plentiful, rooms clean, although some did not have air conditioning which caused a few guests to moan, and quite rightly. Hotel is beautifully set out and is a great base for a holiday- next to the beach, set on a lovely square with benches, and cent door to the train station- ideal for trips up to the. Last to other resorts and to Barcelona, which is both close and cheap to get to. Ideal for kids, you could spend all day on the beach, or there is a nearby Aquapark then wander in the evening and have an ice cream, and there is also a good road train which my little one adored. Place is not too busy and full of different nationalities- a real mix of ages too which catered well for our party. A great holiday for the price we paid. I felt obliged to leave a review after reading so many negative ones on other sites. People, it’s all inclusive, you are probably paying about £5 a day for 3 meals, snacks and drinks! Why are you expecting 5* cuisine? The food was edible, if you aren’t keen on what’s on offer, there’s chips and bread, what can go wrong with that? Yeah, it’s repetitive, but if its variety you want, then why go all inclusive? The bar was nice, the staff friendly considering they were probably sick of drunk foreigners speaking anything from Spanish, English, French, Dutch and German! The bedrooms fit their purpose, I could shower and change there and of course sleep. I was at the bar most of the time so I expected nothing more. The pool area was a bit crowded, but the beach is a stone’s throw away and there is a massive courtyard area if you want to sit and chill in the sun. If you’ve been all inclusive before, then you know what you expect, if you haven’t, either don’t have high expectations or go self-catering. We stayed for 4 nights just for a little break. The hotel is in a great location right on the beach. The hotel itself is lovely and has some really good features. There is a little bar on the beach where you can get beer, soft drinks and water as part of your all inc. This is a real bonus. However, the food has got to be the worst hotel food I have ever had. I am not a fussy eater an don't normally complain but it was so bad we had to eat out a couple of times. I was looking forward to typical Spanish gazpacho and patatas bravas, but none to be found. The salad comprised of lettuce, tomatoes and a variety of pickled veg. No cucumber, radishes, onions or peppers. I know it sounds petty but when you have paid for 3 star food that is what you expect. Also the drinks at the bar aren't that good either. Last year I went to Tossa (costa brava) all inc and I fell in love with Batida coco loco....local spanish drink. I was asked to pay for it here at sorra d'or. The cocktails are pre made and pimped out of an electric dispenser. They are not mixed in fron of you...so no Tom Cruise exhibitions!! Forget the cocktails.....they were not very good. We did get a very good coffee and brandy though. The entertainment at night comprised of a mini disco for children, then someone playing cd's which became very repetative. All in all we had a good time, but it could have been so much better with good food and real cocktails.Would i go again and recommend to friends and family??? Absolutely not!!!! After reading other reviews before booking, we felt confident that the hotel would not disappoint, and we were right! Great hotel for a 3 star; a lot of character and very comfortable. Kept spotlessly clean, room cleaned every day with frash towels. Food was as many other reviews had described it, plenty of choice, always something for everyone, but a bit 'samey.' Longer than a week, you would really feel like eating out for a bit more variety. Really enjoyed the fish though. Hotel location superb, right on the beach and Malgrat train station right next door. We were lucky and had a sea view room; you need to try and ensure you get a sea view room, as once you've had one, no other room would come close! Found hotel staff very friendly and helpful; all spoke several languages, as a lot of Spanish, Germans & Polish people staying. Staff behind bar great fun and friendly. Entertainment let this hotel down; just a quiz one night & disco in the bar most nights. We plan to go back next year to this hotel, we really enjoyed it. Pool area very small, but beach is lovely and you can use the hotel's own beach bar for your drinks. Train station next door is a plus; Barcelona visit a must. The pictures of this hotel don't show the train station which is sitated outside the balcony at the front of the hotel. We hardly slept all holiday due to the trains running and people waiting each night, this went on till early hours of the morning. The rooms are quite small and have no air conditioning, althouugh the room is clean. The majority of the staff don't speak any english and can barley understand what you are saying. There is only sun on the pool for a few hours each day and the pool gets very crowed especially with it being peak time when we went. The food was average, there was a lot of the same thing each day. This was the holiday from Hell and wouldnt recommend it to anyone! We really liked the hotel, it was very clean the food was ok which you would expect for a cheap holiday.we like the location it was 5 mins or less to get to the beach and right near the shops.We thought the staff was execellent they was really nice and made you feel welcome.It was a quite hotel, but gets busy on the weekend, the pool was lovely.We have no complaints about the hotel we would go there again!. We stayed at the Hotel Sorra Dor as our original hotel closed before we arrived! There was alot of choice for meat / fish eaters. Lovely Salad choices and great desserts! The bar staff / restaurant staff were very friendly. We were there just before the season started and I'm glad about that as it was packed the last 2 days and not as chilled out! The pool area is abit strange as the hotel is built around it so only certain parts got the sun at certain times of the day. We were very pleased on arrival to see the standards of the accommodation at this hotel given that it is 3 star. All areas were cleaned to a good standard at all times and the decor and finish of the rooms and public areas was excellent. Sections of the pool area were shady during the day but this suited us as it was very hot when we visited. We thought the food was good with a lot of choice. Breakfast was always eggs, sausage, bacon and beans plus the usual cereals, rolls, croissants, jogurt, cold meat and cheese, toast, etc. Lunch and dinner always included a wide range of fish dishes, meat, pasta, chips, vegetables, soup, fruit, bread, cheese, cakes and salads. Drinks in the restaurant were disappointing with all coffee options being sweetened and juices artificial tasting. Coffee from the bar was freshly made and very good and a good range of drinks were included. The restaurant was open between meals for snacks such as sandwiches, fruit, chips, burgers, etc on the all inclusive option. We found all the staff helpful and polite at all times. There was entertainment on our last night only and this was a disco for oldies! We had a sea view which was fantastic although the train between the hotel and the beach was directly below the window. This did not bother us too much but, as there was no air conditioning in the bedroom, it could be noisy when windows were left open. The hotel location was a brillant one, on the edge of malgrat de mar, as we found wasnt a very nice place, to the left of the hotel is lovely, typically spanish, and their are no hotels, and their is a local market, to the right was malgrat de mar, which our family found loud and quite scally. The hotel staff where terrible, apart from a few at the bar, who where nice and to be fair are good with kids, and make you laugh, the maids are not very nice and are rude, and the woman on the front desk, (the older one) can be described only as the rudest and unhelpful person, mix up with the booking from her, caused a lot of worry and a sleepless night. Firstly if you are staying at this hotel you should know that the bus/taxi will drop you off about 400m away and a suitcase with wheels is a must! The hotel is situated near a railway station which didnt bother us at all. The hotel is also right on the beach which was important for us. The main noise came from the pool area at night. We had a room with a pool view and the noise was so bad one night we moved rooms. The noise, to be fair, was probably down to the gang of Germans as apposed to the hotel but we couldnt stay in that room any longer. Being All Inclusive, unfortunately the gang stayed at the hotel all day and all night. I would have loved a room with a sea view but they were full! There is no air conditioning in the rooms either so we had to hire a fan for 2 euros a day. A fan doesn't really do the job of air conditioning but it was better than nothing. The food was ok. There was always something we liked and didnt go hungry. It would have been handy if the food was labelled as it wasn't always obvious what was what! Most of the staff were helpful and pleasant. There is always a fight for drinks in the evenings and the bar staff aren't always polite. Beware that the Bar Sorra D'or on the side of the hotel ISN'T all inclusive and they charge for your drinks. All in all I would go here again as I loved the location and expected a 3* hotel which was what we go.